This post was written by Katie who is a self-confessed foodaholic and fashion-obsessed blogger from the UK who writes about her favorite clothes, countries and cupcakes. It’s no wonder so many fashion designers are inspired by the beauty of nature. You only have to go for a walk in the woods and see the bluebells peeking up from the forest floor or see golden poppies on the trails of the Golden State to feel truly uplifted. There are plenty of music festivals that you probably wouldn’t want to go to, but lots more that pride themselves on their family-friendly atmosphere. The Creation festivals in the US have a joyous feel while the GoldCoast OceanFest or the Wychwood Festival in the UK have lots of events as well as the music that the whole family can join in. Finders Keepers’ tee-shirt dresses can be worn on their own or teamed with leggings and flat biker boots. Florals may be more associated with off-duty style or with more formal outdoor occasions, but I’ve found the perfect dress to brighten up my day when I have to go into the office. Sitting just on the knee and with a black background, this dress from Erdem has a more business-like feel than other florals, but still manages to retain a playful edge with its yellow, white and blue blooms. I’ll be wearing with my black ballet pumps or investing in a new pair of block heels. It would look equally beautiful on a night out though, with black heels and a clutch. Florals were given a truly tropical vibe by the likes of Raf Simon for Dior and Christophe Lemaire who used swirling, twirling over-sized ferns and flowers. On the high street, La Redoute has a designer-esque version which is simply stunning. With a sweetheart neckline and flared skirt, it’s very flattering. It would be perfect for a summer vacation – I’ll be wearing with tan sandals and a slouchy bag for sightseeing and swapping these for metallic heels and a matching clutch for a rare date night with my other half. Long lunches with family are one of the joys of the weekend, whether at home, at our favourite Italian restaurant or taking a picnic to the park. While, all too often, I opt for my much-worn skinny jeans and Breton-striped top, I’m going to make an effort to turn these lunches into occasions even more special by putting a bit of effort into my outfit. Vintage stores are a lovely way to find day dresses, each probably with a story of family lunches gone by to tell. I love the simplicity of this rose design from Vintage Vixen. I’m going to cinch it in at the waist with a skinny, plaited belt and wear with sandals on sunny days. 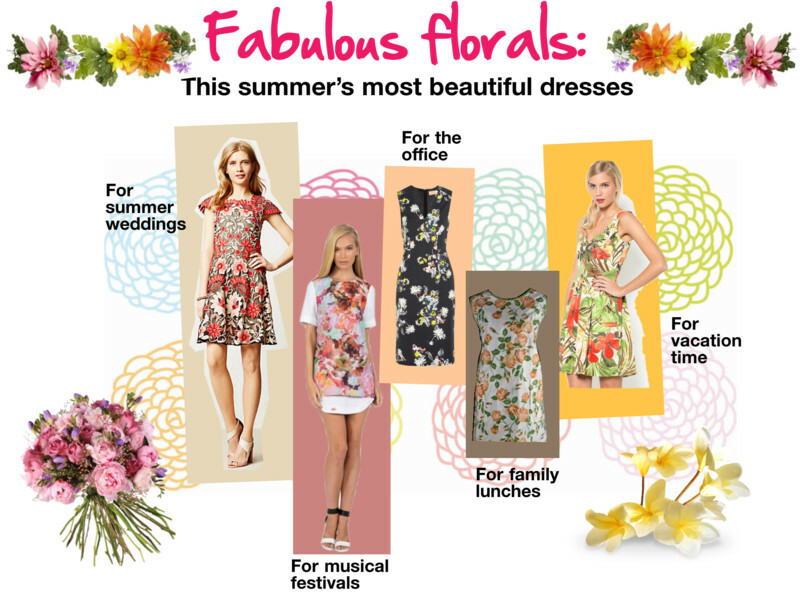 They’re all beautiful pieces that just go to show why fashion’s love affair with florals is so enduring. They look perfect for the summer.